Our Junior School is fortunate in having an extensive and well-resourced site where pupils have access to a wide range of classrooms, sporting facilities, science laboratories and a modern, state-of-the-art library. These specialist facilities ensure our children have access to the very best amenities in order that they flourish and progress in a wide range of subject areas. Through our dedicated teachers and a forward looking approach, Bradford Grammar Junior School offers a fulfilling and nurturing environment where children have endless opportunities to flourish and develop as individuals. With activities ranging from drama to gardening, co-curricular opportunities are endless. This allows our children to utilise and express their unique skills and characters in an inspiring and creative environment. We develop confidence, self-esteem and independence and work closely with parents to ensure that every child receives the best possible pastoral care. When our children make the transition from the Junior School to our Senior School, we ensure they are prepared and equipped with the necessary skills to positively embrace the new challenges and opportunities ahead of them. 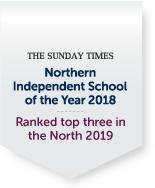 We are proud to offer an outstanding education and are ranked by ‘The Sunday Times’ as the ‘Northern Independent School of the Year 2018’. So you can feel confident you are making the right choice for your son or daughter.